WILSON-GOODMAN LAW GROUP,PLLC was founded by Angela M. Wilson in 1997 as the Wilson Law Office, P.C., a solo practice in the town of Gilbert. As Gilbert enjoyed tremendous growth over the last few years, so did the firm. The Wilson Law Office has now evolved into WILSON-GOODMAN LAW GROUP,PLLC a law firm consisting of five attorneys and eleven support staff. WILSON-GOODMAN LAW GROUP,PLLC is committed to delivering high quality legal representation at reasonable rates. All of our attorneys and support staff are dedicated to exceeding our clients' expectations by giving them prompt professional attention and communicating with them so that they can make informed decisions regarding their case. The firm offers a wide range of legal services to not only Gilbert and the East Valley areas, but to all of Maricopa and Pinal Counties. The law office of Wilson-Goodman Law Group P.L.L.C., provides a wide range of legal services to meet the varied needs of individuals and families in Phoenix, Arizona. We serve clients in Maricopa County and Pinal County, and the communities of the East Valley, including Gilbert, Chandler, Chandler Heights, Mesa, Tempe, Queen Creek, Apache Junction, Casa Grande, Florence, Gold Canyon, Eloy, Maricopa, and Coolidge . 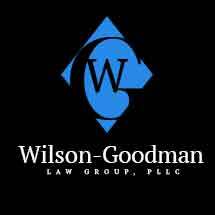 I had a very good experience with Wilson-Goodman law group. Angela's decades of knowledge in legal matters are invaluable when dealing with a difficult legal situation. She has put together an amazing team and with her experience at the core, has created an amazing group of capable attorneys. I spent over two years with Angela and her team. She was able to represent me through a difficult divorce with hostile attacks from the opposing lawyer. In court, I was relieved to have one of Angela's team representing me with calm, sincere and intelligent communication. During settlement meetings, Angela dominated the environment and led the way. She took advantage of a situation created by my ex-wife's lawyer and created a settlement meeting which caught the hostile lawyer off balance. Her ability to take advantage of that situation, which finally presented itself after years of careful defense, was amazing. In one 8 hour session, she was able to take the two years of work and create a settlement that met my needs. Two years earlier, I would have been begging the judge for fair treatment and getting none. Angela and her team helped me create the fair treatment that I deserved through careful choices. At times the situation required making sacrifices, like agreeing to a family evaluation. But in the end, those sacrifices helped gain leverage and legal equity that led to a settlement. During the actual settlement negotiations she was a force to be reckoned with. She also helped me determine what was important to me, including what I could give on a little to make the settlement work. Through all of this, Angela was fun to communicate with. She was witty, frank and often light-hearted. Angela is quick to the point and gives thoughtful, helpful answers to my inquiries. Angela's matter-of-fact, "tell it like it is" style was very refreshing and reassuring. She was quick to respond, even during the evening. I got answers when I needed them throughout the whole process. I needed Angela Wilson-Goodman law group and anything less then their experienced representation could have had such a negative impact on my life. The custody and time with my kids, retirement, equalization for the house and so much money lost in child support and property were all at stake and I could have lost so much. It was so close to being taken from me by an aggressive lawyer and a hapless court system with no understanding of my situation. The court would rule against me just to protect from the possibility that the false claims were true. I was on the edge and Angela Wilson-Goodman and her team fought with me and protected me from disaster. Thank you so much to Angela, Tiffany, Lisa, Haley and all the rest.